Does somebody knows what size of oil line connectors are needed to get this installed? I know they come with this kit but I want to know. It has -6AN fittings and comes with hose. 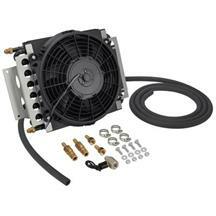 However the stock cooler lines for the 05-10 Mustang (not sure about other models) have much larger lines, so the fittings did not work connecting directly to the stock lines. I ended up buying a couple barb-end reducers that went from the 1/2" stock lines to the 3/8" cooler host, and connected things by splicing into the stock cooler's hose line (essentially connecting the Derale cooler in tandem with the stock cooler).